Yes Gardenstew is alive with great people. I got such an amazing response from everybody who read the newspaper seed pot tutorial. I am so enjoying myself. Thank you all!!! Hmmm... now the pressure is on. What other useful tidbit can I share? Stay tuned my fellow "Stewies" I'll see what I can "cook" up. Beware I often fall prey to the evil pun beast. Hope is alive again and lives in my preparations for the garden! Yo Ho! Borage nods in a soft summer breeze - in a past life, but soon, yes soon. Those are beautiful plants .Must find one. Great photo, Jo. If you are not aware, we have a photo archive in the members gallery. I have put the borage pic and the sunflower pics in there. That way we can see them whenever we wish (or show them off) without remembering where they were. The reason the newspaper seed pots got such a great response I think Joy is that it was a tutorial which we'd see enough of. Not only was it a tutorial but it was really easy to follow and the photo steps were fantastic. oh how it fuels the heart for summer yet yo be. Here, here to the newspaper tutorial! I've seen the little pot maker things in catalogs for years, but I'm too cheap to pay for something for which sweet and wonderful people are willing to share methods. Two green thumbs up to you and the stew! LOL Zu, yet yo be. 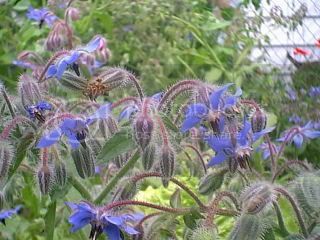 Borage is a favourite of mine for the garden as it attracts so many bees. Thanks for the piccie Joy. Thanks for the picture Joy, I have never seen borage, it is very pretty. I wonder if they would live in Texas heat.I just really love that plant.I do like the color. I would love to try to grow one if I can find it here in a nursery.